The Monastery of Hagios Ioannis Theologos (Saint John the Theologian) and the Cave of the Apocalypse on the island of Pátmos, together with the associated medieval settlement of Chorá, constitute an exceptional example of a traditional Greek Orthodox pilgrimage centre of outstanding architectural interest. The Monastery of Saint John the Theologian overlooks the village of Chora and is the trademark of Patmos. 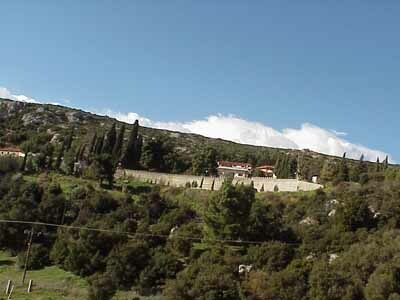 The Reverent Father Christodoulos (slave of Christ) founded it around 1100 and is, from since, the most significant religious centre on the island. Tall, thick walls with fortifying towers and ramparts are surrounding the monastery. Those walls are built according to the Byzantine architectural style. The monastery library is noted for its manuscripts, but especially for its collection of more than 200 icons. The oldest book in the library is part of a 6th century codex of Mark (Codex Purpureus). The second oldest manuscript is an 8th century A. D. copy of Job.